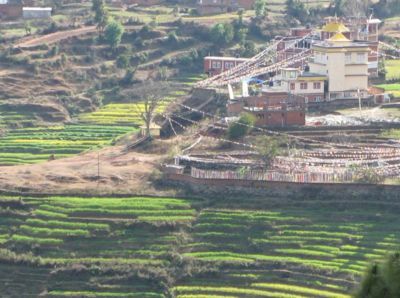 Pharping, a town south of Kathmandu in Nepal, is identified with the sacred site of Yangleshö (Tib. ཡང་ལེ་ཤོད་, Wyl. yang le shod), where Guru Padmasambhava attained the level of a Mahamudra vidyadhara. Yangleshö is thus, according to Katok Rigdzin Tsewang Norbu, considered to be for Vajrayana practitioners as important as Bodhgaya because it is where the second buddha Guru Padmasambhava attained the state of enlightenment. There are two major practice caves in Pharping blessed by Guru Rinpoche: the Asura cave and the Yangleshö cave. At the bottom of the flight of stairs climbing up to the Asura cave is an old and important Vajrayogini temple, the Pharping Vajravarahi temple. Other stairs also lead up to the cave. They start towards the end of the village, at Ralo Rinpoche's monastery and start by a shrine containing a self-arisen Tara on the side of an image of Ganesha. To the south of the village is the temple of Dakshinkali, one of the four Kalis surrounding the Kathmandu valley. Pharping also has several monasteries, temples and retreat centres, including Chatral Rinpoche's monastery, and the Palyul Retreat Centre, which is the residence of Khenpo Namdrol Rinpoche and home to the Rigpa Shedra. Pharping is known to the Tibetans as Yangleshö, and to the Nepali as Pharping (pronouce "farping"). It was also known as Phamting. Some say it is because it is the birthplace of the Phamtingpa, the heart-son of Naropa, and his brothers. Chatral Rinpoche explains that the 'Indian Phamting' (rgya gar pham thing) derives its name from the presence of the great hood of the naga king Lhakmachen or Shesha which indicate that it is a place associated with him. That is why the learned masters of the past used to called it Phanathingu (pha na thinggu), which means 'the nine hoods', and the usage ebbed as Phamting. Pharping has not only been blessed by the master of Oddiyana's practice with his consort Shakyadevi and his attainment of the vidyadhara level of Mahamudra, it has been also visited by many great beings, like long term resident Marpa Lotsawa, who practised, made offerings, ganachakra feasts, aspiration prayers and so on. Chatral Rinpoche, yul chen po nye ba'i tshandho ha bal po'i gnas kyi dkar chag gangs can rna ba'i bdud rtsi, n.d. 26bl.6-29bl.5. Khenpo Menlha Phuntsok, ne p'al nang pa'i gnas yig dngul dkar me long, p.64-71. The map of Pharping shows the location of the Rigpa Shedra. Use Google Earth for a view on the retreat centre: Shedra East at Palyul Retreat Centre. This page was last edited on 4 September 2018, at 20:51.